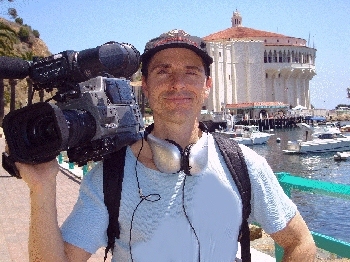 Like so many young men, Jim, an alumni of Illinois State University, came to California from Chicago to pursue the film industry, before discovering his real venue would be television. One of nine children in his family, Jim began his interest in documentary filmmaking with Super 8 films in high school, an interest he expanded in college. Jim loves the physical world, and goes faithfully to the gym here in Los Angeles, and he really needs it, as OUT & ABOUT continues to take him to all kinds of places. Jim began collaborating with Roger back in 1991, and in the twenty five year history of OUT & ABOUT, has videotaped, written and edited every episode since its premiere.